Last night I read this article on CNN. CNN’s attempts to contact politicians have been unsuccessful. When CNN asked Brown for his stance on reparations for sterilization victims, press secretary Gil Duran sent an e-mail referring to the statement. “There’s nothing more to add,” he wrote. I was deeply grieved when I read the unwillingness of California politicians to engage this matter or to enter the stories of those who suffered injustice and victimization at the hands of the “system” – a system whose proponents included, by the way, the President of Stanford and the publisher of the LA Times, as well as “the country’s intellectual elite such as doctors, geneticists and Supreme Court justices”. These words stirred up something deep within me. How often is this our response? As individuals or organizationally, we may have created or perpetuated systems that marginalized, abused and victimized a group of people. Perhaps this was brought to our attention, and a sincere and concerted effort was made to change. For many of us, the responsibility stops there. If someone approaches us about the past harm inflicted or its lingering effects, our response is “there’s nothing more to add.” Perhaps, if we are Christian, we even chastise them for not forgiving and we encourage them to show us a little more grace next time. I’ll stop speaking in generalities and be a little more blunt: I think this ties in so well to what my ethnic minority friends experience, as well as potential default reactions in myself. I’m well-aware that the CNN article deals with eugenics and not racism, but I think what these stories illustrate about apology, restitution and reconciliation has much to teach me, if I’m willing to learn. I’m young in my service with Cru so by sheer “luck” of my birth year, I have avoided being part of some hairy, icky things that have happened in our organization regarding ethnicity and ministry and yet, being also young in my own cultural journey, I’ve also contributed to the marginalization that others have felt. Maybe I’ve apologized for those things; maybe the people who were more involved in the “ickier” parts have also apologized for the role that they played. But after reading this, I am even more resolved: if someone has the courage to approach me and tell me how I’ve harmed them in the past then, whether I feel I’ve apologized for that before or not, I’m going to apologize again. I’m going to ask them about their hurt. I am going to be willing to enter their pain, whether or not I feel it’s “legitimate”. And then I’m going to apologize again if I need to. As long as it takes for them to feel heard and honored. Our goal is to bestow honor and to restore dignity to those who have been harmfully treated at our hands, and that will require that we humbly put aside our embarrassment at being called out yet again, and our potential frustration at having to address an issue yet again, and we will do what it takes to show love to other sons and daughters of Adam. 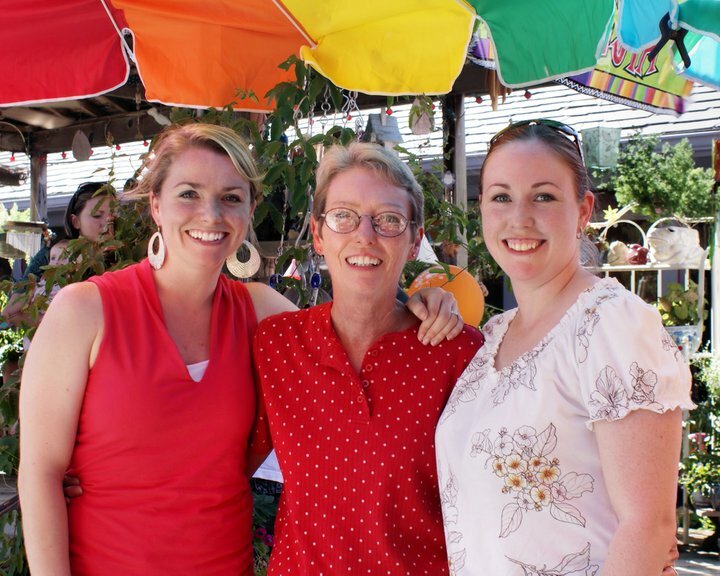 Perhaps we will even need to follow in the footsteps of Bev Perdue, governor of North Carolina, and set up venues for these voices to be heard, and then we will need to actually listen. An apology without conversation and without story is a self-serving tool which can be effective at making us feel better, but has no real power to touch the heart of the wounded or to move us forward in authentic reconciliation. Because true apologies honor the wronged by being willing to hear their stories. There are few meals that stir up as many images of God’s bounty for me as hotpot. Especially how the Poons do it. The table overflows with meat, veggies, noodles, dumplings along with many things my white friends have never heard of and that I wouldn’t begin to know how to successfully describe in English. But they are all absolutely delicious. One table is usually not enough room to contain all the food; we need a separate side-table just for more food! Over the Christmas break, Jason and I shared this meal with my family (read: southern white people) and were oh-so-delighted when they received it enthusiastically. For Jason and I were not just introducing them to one of our family’s favorite meals and traditions – we were sharing with them our very hearts and selves. There are times to eat simple meals, and there are times to feast. On this day, we do the latter. We feast to celebrate that a new year has come, God has enabled us to see it and He has given us sweet friends and family with whom we can share it. 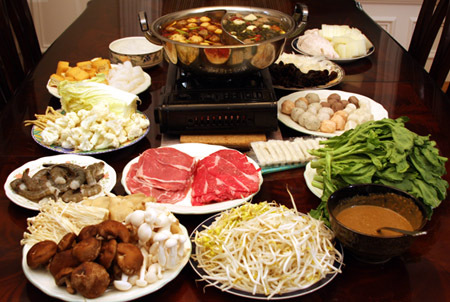 Tonight we will have another hotpot in honor of the New Year. It will be a little shorter on people but totally equal in love and, of course, delicious food. As we eat and talk together, I want to allow my heart to bask in the glow of God’s abundant generosity to us revealed in a feast and being able to share it with friends who are our family. Just like every year, 2011 has been a mixed bag. Plenty to celebrate and rejoice over, and much to mourn and work through. For all of these things, we give glory and praise to God for His obvious hand in our lives. We have found Jesus to be faithful in all things, and that alone has made it a good year. Seeing two of our best couple friends realize their hopes of becoming parents as they finalized adoptions. It remains a great honor in our lives that we get to walk through life with such amazing people, and their joy was our own as we saw their dreams come true. Here’s the story of one. Going back to Colorado to minister to our new staff as stewardship trainers. It’s one of our favorite things that we do every year, helping our staff make a budget and honor God with their finances. Eden’s first birthday party. Well, really just seeing her turn 1. The party was special, but even more so was being able to praise God for her first year of life. And celebrate that we survived it. Booyah! My 30th and 31st birthdays. I actually turned 31 this year but I had two birthday parties – one for my 31st and one to make up for last year, when my 30th birthday was not really on my radar. Eden was three weeks old. At that point, my “dream” party consisted of a solid night’s sleep. We made up for it by throwing me a big ice cream party this year. Fun! Seeing our nephew play in the State baseball tournament at the Dell Diamond. Jason and I kind of hate baseball, but we both got into it and were very excited to watch him play. I got to hear one of my heroes, Dan Allender, speak in person for the second time. I may have been a little nuts about it; in the first thirty seconds, I shushed the people behind me because they were talking as he began. What can I say? His writing was instrumental in completely turning my life around seven years ago… so of course I couldn’t miss even one second of what he was saying. Obviously. We got the bufferback. This is silly, and not really very important, but it did feel nice to put some pound-distance between myself and Jason again. We both feel so blessed that recently our home and work life has just totally been awesome. We both feel like we have a partner in each other and we’re each doing work with Epic that is joyful, fulfilling and life-giving. Definitely a season to cherish. And there’s so much more – falling more deeply in love with each other, watching our daughter truly become more and more delightful by the day, praying for and then seeing God’s provision, experiencing restored friendships, embracing the body of Christ around us as our family – there has definitely been a year’s worth of joy in the last twelve months. Happy 2012, dear friends, and here’s to another year of receiving God’s goodness to us all! Up until recently, I have not sought out information on the Penn State scandal. I have picked up more than bits and pieces, though, as I am almost constantly connected to social media, and my husband has followed the story with interest. Quite honestly, I’m sure that this avoidance has been purposeful, if even on a somewhat sub-conscious level. The nightmare of sexual abuse is one that I know from personal experience and, though I have pursued and obtained much healing, powerful waves of emotion can easily overtake me when things like this come to light. It is a feeling that I deal with as it comes, but not one I often go looking for. There is so much to be sad, angry and sickened over. Whether it is a coach, family member, clergyman, or a stranger, the effects of sexual abuse are immediate and catastrophic to the victim’s soul. There is no human punishment befitting of the one who commits such an awful crime against the body, soul and spirit of another. I have been in sadness as increasingly horrific details emerge from this specific case, and more than a little angry when I think about the silence of those who witnessed some of the abuses, but said nothing. Apart from the particulars of this current and well-publicized scandal, I am once again rocked by the pervasiveness of sexual abuse. The statistics are horrifying: 1 in 4 girls and 1 in 6 boys will be abused before the age of 18. Those numbers are nauseating, and probably low. Dan Allender says here, “I know that everyone in America is relating directly and intimately with at least one person who has been sexually abused. And damn it, we don’t talk about it.” Once confronted with the reality of the proportion of the population who has been abused, the silence of our culture is deafening. If you haven’t already clicked through to the Allender post, please read it for his thoughts on this phenomenon. What has been weighing especially heavily on my heart and what I keep coming back to that usually receives little-to-no airtime, is the home of the abused child. If the numbers above frighten you as much as me, these are equally troubling: the vast majority of survivors are abused by someone they know. (94% in one study.) The implications are enormous. Certainly, there are many cases of sexual abuse that are “random” acts of evil and not in any way brought on by a caretaker’s negligence. But often, a predator looks for a person whose soul is not nourished at home, leaving them vulnerable and unprotected to the perpetrator, and without a safe place to turn to after the damage has occurred. You can imagine the psyche of a child who undergoes consistent, lasting torment at the hands of another and doesn’t say anything: before the attack occurred, that child’s voice had already been lost. There is nothing more unsettling for a child than the feeling of powerlessness that comes with the knowledge that those who are put on this Earth to protect them have either contributed to their abuse, turned a blind eye when they saw it, or given them no place to turn when they were violated. Facing the reality that those who are supposed to protect us have abdicated their role and left us to the wolves is profoundly damaging. In fact, it is more than some can bear. I have heard women talk about their families, how wonderful, loving and supportive they are, yet also admit that they have never spoken of their sexual abuse to their parents. There is a major cognitive “miss” here. The betrayal of the family is not acknowledged. When I first began to face my abuse and name it, this is where most of my reflection occurred and the source of my most profound pain. It was as if the scales fell off of my eyes, and I began to face for the first time that my family was not a place of safety, that my parents were committed to many things more deeply than my protection, and that the dynamics there had actually “set me up” to be abused. I need to be clear here in that absolutely no fault can be removed from the youth pastor who initiated a physical, sexual relationship with me. The responsibility of his actions belongs to him alone. I am not removing the blame from the abuser-proper. Rather, the unsafe family is a fertile breeding ground where the evil of sexual abuse can grow more easily and often unchecked. If the numbers of children who have been abused is on the rise, and if the vast majority of those abuses are from a family member, friend or acquaintance (in other words, not a stranger), then it seems we are losing the family as a place of safety. We are losing parents who really parent, and therefore we are losing childhood, and children. I have no solutions, but I do know that fighting this darkness requires that we move toward it, rather than cowering in fear, discouragement or denial. We must begin to name our abuse and that of our friends, spouses and children. In that naming we will begin to give a voice to those who have been silenced; we will refuse to further victimize ourselves and others through denial; we will enter the story that up to a quarter of Americans are living. Having the courage to enter the story is where healing begins. Today we celebrated Eden’s first birthday. Though her actual birthday isn’t for a few more days, it was wonderful to celebrate and rejoice over her first year of life. Honestly, I’ve always thought first birthday parties were pretty stupid. It seems silly to spend a lot of time and effort since she won’t even remember it. But we made a big effort anyway. For one thing, I have creative friends and I’m a sucker for cute party themes. But, even more importantly, I realized that the party really wasn’t for Eden anyway. It was for Jason, me and the community that we have around us which has played a huge role in her first year of life. They have become our family. It was with these dear people in our lives that we both remembered her day of birth and also held a time where we officially and publicly dedicated ourselves to raising her in the Lord. Then we prayed over her life. What made it even more meaningful was the sentiment that both Jason and I had going into this day. We have a hopeful anticipation of what the Lord is going to continue to do in our lives, and that starts with the close of this year. A few weeks ago, I had the privilege of talking to someone I respect greatly in ministry. As I asked him questions about his life serving the Lord, he mentioned a four-year period in his life that was very low. I think he even used the word, “dark”. Four years is my entire marriage. It’s most of my time on staff with Cru. It’s a huge chunk of my adult life. But for this man who has served the Lord for 30+ years, four years feels much different. I’m sure that time was significant to his life- of course it was. But it in no way defined him. Because of the events of the last four years, I think there have been times when I have been tempted to think that this is my life. It ceased to be a season and just became… my life. Having that conversation gave me so much hope. I’m sure that my dear friend never thought he was being encouraging by mentioning a four year dark period in my life. But I latched onto his words, and I was encouraged. I pictured being four years away from now – in a completely different place in my life – and being able to look back over the past few years as the dark time. It has become my prayer. It would be foolish to say that pain and tragedy will never have a place in my life again. It will – that’s just life. But we are hopeful, and tonight my dearest friends and family joined with us in praying that this might mark the end of the dark period. There will certainly be more to process and more that God will want to reveal to us through what we have experienced, but we are praying in faith that we may, in a significant way, close the door on this part of our lives and move forward in joyful expectation of the next chapter that God is bringing. Tomorrow (July 10th) is my mother’s birthday. We called my mom “Pants”. And although we appreciate her every day, tomorrow is the day that we’ll set aside to do a few things that Pants really loved. For one, we have to wear pants. Obviously. We’ll also go out for Mexican food. Pants ate some sort of Mexican food nearly every day of her life for the last few years. That is no exaggeration. The woman loved her jalapenos!! Even though Jason and I are not able to be with my family tomorrow, we’ll gather with some friends and celebrate my Mom’s life through some enchiladas or tacos. Those are the basic requirements. Pants + Mexican food. But since it happens to be the Women’s World Cup, we’ll also start our day watching the USA v Brazil game. Pants LOVED watching pretty much any kind of sport, so we know she’ll approve. I mean, it won’t be as good as her Cowboys, but that’s ok. If there’s time left in the day, we may attempt a puzzle. Especially when I was younger, that was an activity that she and I loved to do together. We almost always had a puzzle going. That’s what our Sunday will look like – we’ll be participating in the first annual Pants Appreciation Day, and we invite any of our friends and family to join us!